FujiFilm winds down production of the film that extended the useful life of some of history’s most inspired gadgets. For a pretty significant percentage of the instant cameras Polaroid ever made, the answer, surprisingly enough, has been “Yes, you can.” In many cases, that’s been because of FujiFilm, which has continued to produce peel-apart film that works just great in a bevy of Polaroid models from the 1960s and 1970s, such as the wacky and wondrous Big Shot, Andy Warhol’s favorite. But when I was skimming my Facebook feed this morning, I saw a horrifying note from Christopher Bonanos, author of the excellent Instant: The Story of Polaroid: FujiFilm is discontinuing production of FP100C, the last film it made for these cameras. The company’s site has an announcement–in Japanese–which says that it made the decision because of declining sales and will end shipments this spring. Rather than immediately disappearing from the market, it’s likely that the supply will dwindle until it’s all gone–and the cost per pack on Amazon is already surging in the wake of the announcement. The news didn’t exactly come as a shocker: When I first got into shooting with Polaroids a half-decade ago, Fuji made black-and-white film in two different speeds as well as color film. Both black-and-white versions had already bitten the dust, leaving only the color film, which will now be going away. This isn’t the end of the road for instant photography. The Impossible Project continues to make film for Polaroid’s iconic SX-70 and later models that pop out a tidy picture that develops before your eyes rather than requiring you to peel apart a chemical-laden film sandwich. 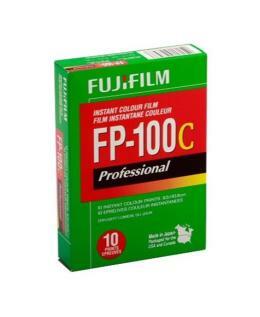 Its film is a blast to use, but a lot pricier and fussier than FujiFilm’s product. New55 offers large-format peel-apart film. FujiFilm sells Instax instant cameras and film which are Polaroid-esque, even though Polaroid itself didn’t have a hand in them. They were everywhere last time I was in Tokyo, and are widely available in the U.S.; one model is even sold, in rebadged form, under the Polaroid name. I own a number of instant cameras that aren’t affected by FujiFilm’s discontinuation of peel-apart film, and will continue to take pictures with them. But the first thing I did after reading Bonanos’s post was to order an imposing quantity of FP100C 10-packs–enough to keep me shooting, in moderation, with my Big Shot and 360 cameras for a few more years. I’m sure others who take pleasure in the photographic process invented by Polaroid’s cofounder and presiding genius, Edwin Land, will do the same until FujiFilm’s warehouses are bare. When Polaroid itself announced that it was ceasing production of instant film back in 2008, it made headlines and it appeared to be the end of an era. Thanks to the robust quality of the cameras the company produced decades ago–and the simple pleasure of using them, even in the digital age–a lot of people have been unwilling to accept that fate. And in a way, the disappearance of FP100C will be sadder than the loss of Polaroid’s own film. Barring a miracle, all those cameras that kept on being useful long after Polaroid abandoned them are going to end up as attractive, evocative doorstops.